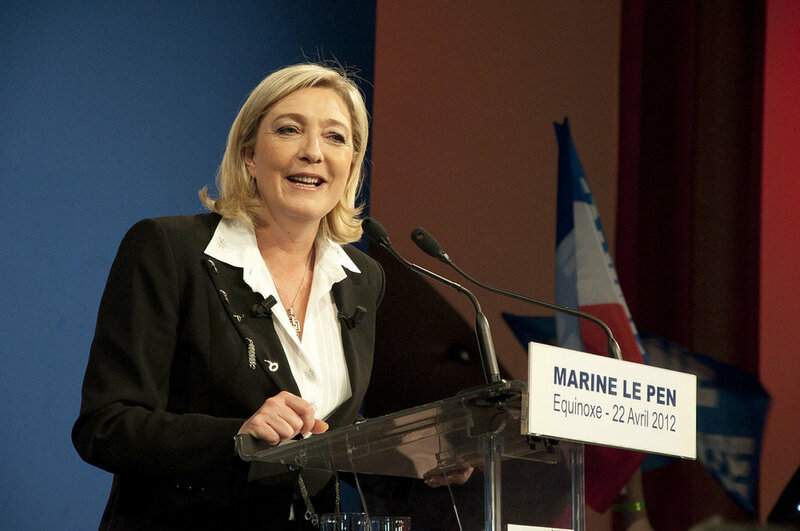 French politician Marine Le Pen served as President of the National Front from 2011 to 2017. In a speech on April 27, 2016, then-presidential candidate Donald Trump addressed his foreign policy as making decisions to “put the interests of the American people and American security above all else … ‘America First’ [would] be the major and overriding theme of [his] administration,” according to the Washington Post. Although his statement rallied a large base of support, its nationalist rhetoric is extremely destructive to the international system of collaboration and collective security. Beyond Trump’s nationalist policies, there has been a rise of anti-immigrant sentiments and populism around the globe, which is evident in recent elections in European countries. This is especially true in France, where voters narrowly avoided electing anti-immigrant nationalist Marine Le Pen. White supremacy in nationalism is a dangerous ideology because it intensifies racism and xenophobia and garners pride in racial purity. Although politicians define nationalism in a variety of ways, many populist leaders like Trump use it to promote their racist, xenophobic agendas. As Ernest Gellner, a British-Czech philosopher and anthropologist, said, “nationalism is not the awakening of nations to self-consciousness: it invents nations where they do not exist.” Instead of garnering pride for one’s nation and the way it interacts with other global political actors, nationalists create an exclusionary rhetoric that ignores strides towards multicultural unity, isolating themselves. Modern nationalism especially draws on hatred of racial and religious minority groups. For example, according to “Republic of Islamophobia: The Rise of Respectable Racism in France” by James Wolfreys, Marine Le Pen “championed” a “new form of racism… which makes it ‘respectable’ to attack Muslims” through her policies. Le Pen “believes that only her particular brand of political isolationism and economic nationalism can protect France.” Le Pen’s nationalism directly endangers anyone outside of the norm of governing with equality in mind, which produces domestic instability. Similarly, Trump’s administration is also taking steps to further his nationalist agenda by scapegoating immigrants through the travel ban, restricting travel from predominantly Muslim countries. This is a dangerous ideology that threatens the future of the international political system. To jeopardize worldwide peace in the pursuit of prioritizing domestic values is detrimental to international cooperation. When the U.S. elects nationalist leaders, other states think that it’s acceptable to do the same. In the months after the 2016 U.S. presidential election, states such as Britain, France, Hungary, Poland and Turkey held elections with prominent nationalist candidates. Electing a nationalist head of state in one nation will encourage populist thought in others. Other nations are also less likely to ally with a state that only has its own concerns in mind. Although political scientists H.R. McMaster and Gary D. Cohn argue that “America First does not mean America alone,” prioritizing the interests of the U.S. ostracizes key allies like New Zealand, whose leaders are upset by nationalist states’ “global turn inward.” Isolationism is unproductive because there is no way to move forward without unity between all global powers. The violence inspired by the views of Trump and Le Pen prove that nationalism can and will lead to domestic and international conflict. To mitigate the effects of dangerous nationalism, it is necessary to stop legitimizing it. Major media networks should stop treating nationalist ideology as benign and worthy of the same consideration as other political ideologies. Voters must promote non-nationalist candidates in the voting booth, as this is the alternative that will block exclusionary policies and isolationist international politics. By taking tangible action, the threat of white supremacy and nationalism can be stopped before they destroy the international system.